FILE - Nancy Hatch Dupree listens during an interview with The Associated Press at the Afghanistan Center at Kabul University, Afghanistan, Dec. 9, 2014. Nancy Hatch Dupree, a prolific American expert on the history, art, and archaeology of Afghanistan, died Sunday at the age of 90 after battling an illness in a Kabul hospital, officials announced. Dupree arrived in the country in 1962 as a diplomat’s wife and dedicated the rest of her life to collecting and preserving the war-shattered country’s cultural heritage. In 2013, she founded and opened the Afghanistan Center at Kabul University (ACKU), the first facility of its kind in the country dedicated to the study of Afghanistan's history, culture and society. The late historian was the director of the center until recently. “Her vision for ACKU was that it would contribute to the reconstruction of Afghanistan by gathering in one place scholarship on the country’s culture, history and politics,” the center said in a statement. 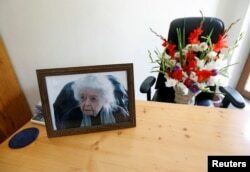 A photograph of late Nancy Hatch Dupree, an American historian, and a bouquet of flowers are seen in her office after she passed away, in Afghanistan Centre at Kabul University (ACKU), in Kabul, Sept. 10, 2017. In several VOA interviews over the years, Dupree said the ACKU was inspired by the work and vision of Louis Dupree, a renowned archaeologist and scholar of Afghan culture and history, for whom she left her diplomat husband. The couple took refuge in neighboring Pakistan after they were pushed out of the country in 1978 by the then Soviet-backed Afghan government, which suspected Louis of being an American spy. After the death of her husband in 1989, Dupree continued her mission of preserving Afghan history for years using her residence in the Pakistani border city of Peshawar as a base and storage facility. The Afghan civil war of the 1990s and subsequent emergence of the Islamist Taliban government did not deter Dupree from visiting Kabul regularly and bringing back books, maps, photographs and rare Afghan folk music. The material also included government and non-government documents, as well as surveys, reports, and newspapers from the Afghan factional fighting and the Taliban regime. In several interviews to VOA over the years, Dupree said her team often found torn copies and pages of looted priceless history books on the streets of Kabul being used by shopkeepers to wrap food material for customers, or to use as fuel. Speaking to VOA at her residence in the University Town of Peshawar in early 2008, Dupree explained difficulties she faced while collecting the material during the Afghan civil war. In 2005, Dupree packed the preserved documents in nearly 300 plastic bags, used for filling wheat or fertilizer, and then loaded them on trucks to smuggle them back to Kabul from Peshawar. They are now safely stored in ACKU and are in the process of being digitalized to make them available for students cross the globe studying Afghan history. Nancy Dupree traveled across Afghanistan and wrote several guidebooks on the country. FILE - Nancy Hatch Dupree and her colleague show an archived paper of the Taliban regime during an interview with The Associated Press at the Afghanistan Center in Kabul University, Dec. 9, 2014. Afghans viewed her as one of their own and even the Taliban did not hamper her work when the Islamist group was in power in Kabul from 1996 to 2001. Afghanistan’s mainstream media paid tributes to Dupree’s work and dedication while social media was flooded with condolence messages. 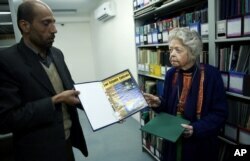 The U.S. Embassy in Kabul described Dupree as “a pillar of the American community in Afghanistan for many decades, saying she worked tirelessly for the preservation of Afghan history and culture. “Future generations will remember Ms. Dupree as a wonderful example of the strength of U.S.-Afghanistan relations and friendship… May we honor her example in decades to come by working for a common goal of building lasting fraternal ties between our nations,” said an embassy statement.